I’ve detailed exactly what my project is in a couple of earlier posts (you can find them here and here) but to sum up. 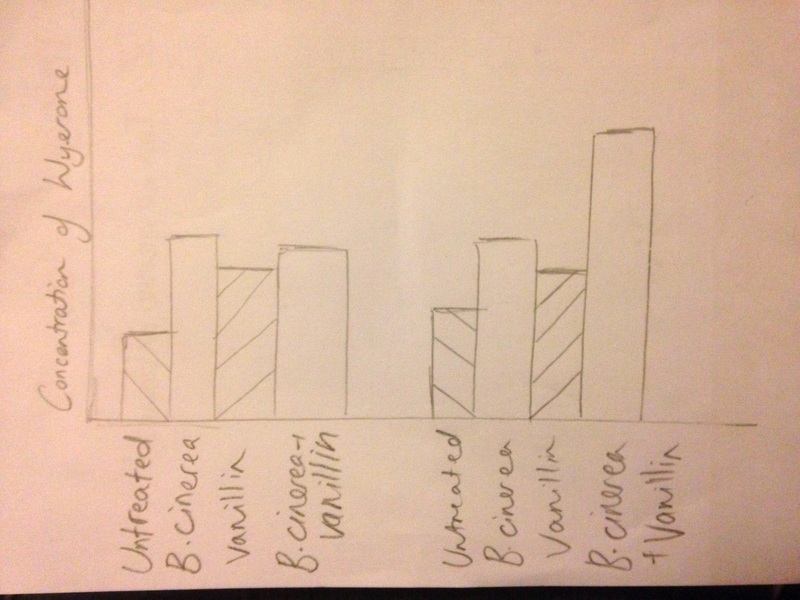 Vanillin is the main component of vanilla (and is responsible for the smell), I’m testing whether it elicits defence responses in plants, therefore making the plant more resistant to subsequent pathogenic attacks. So how do you test this? 1. Well ideally, you’d collect some broad bean leaves, treat them with your product, infect them, leave them for a few days and then score the level of infection a few days later. B. fabae causes a disease known as chocolate spot on broad bean. My pathogen is fat and lazy. I’m using Botrytis fabae, a pathogen specialised to infecting broad bean but it has been kept on agar plates for a long, long time. Having been kept on agar, it has become used to a constant supply of nutrients, no need to spend energy infecting plants the resources are just there. So when faced with a leaf, it doesn’t infect very well as you can see from the picture. Agar plugs of B. fabae were placed on the leaves and all the sites should show some signs of infection, but they don’t. So, instead I’m using Botrytis cinerea, a relative of B. fabae. B. fabae is specialised to broad bean and so can not infect any other plant, while B. cinerea is a generalist and will infect whatever it can. However, so far this is also not going well as my B. cinerea is also not behaving. So let’s hope I can sort that out before I have to finish my labs later this month. After a bad start this one has been going well, and touch wood it stays that way. So initially our cotyledons kept getting infected by soft rots, but this was resolved by buying some new clean seed. So 1) what are cotyledons and 2) how can you use them to look at induction of defence responses in plants? 1) Cotyledons are the first leaves of the plant. In broad bean they never emerge above the soil so you can get them by peeling the seed coat off. 2) When a plant is infected by a pathogen it produces a range of defence responses, this includes the production of phytoalexins. The term phytoalexin covers a huge range of compounds which all have some antimicrobial activity. 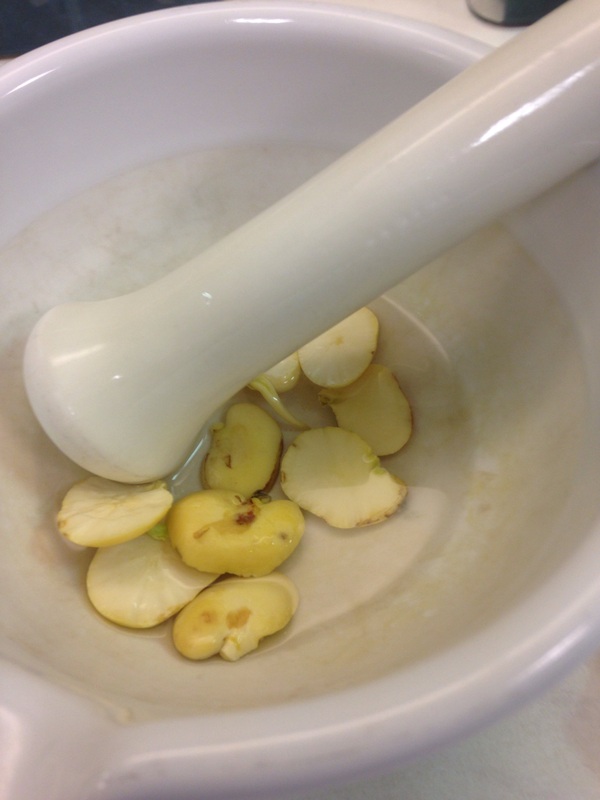 In broad bean the main phytoalexin is wyerone. 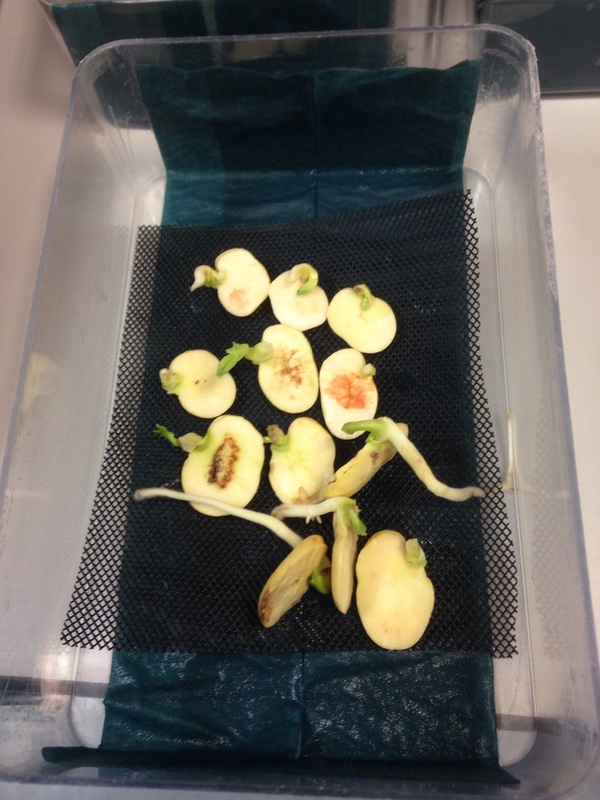 So to get the cotyledons, seeds were placed in boxes of damp tissue paper and left to germinate for a few days. 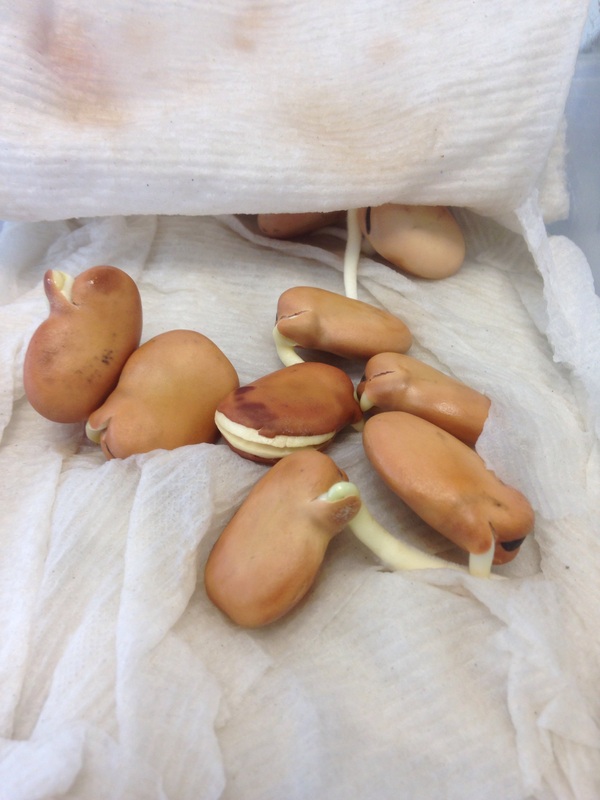 The seeds were then peeled to give two cotyledons. This process is shown in the images below. 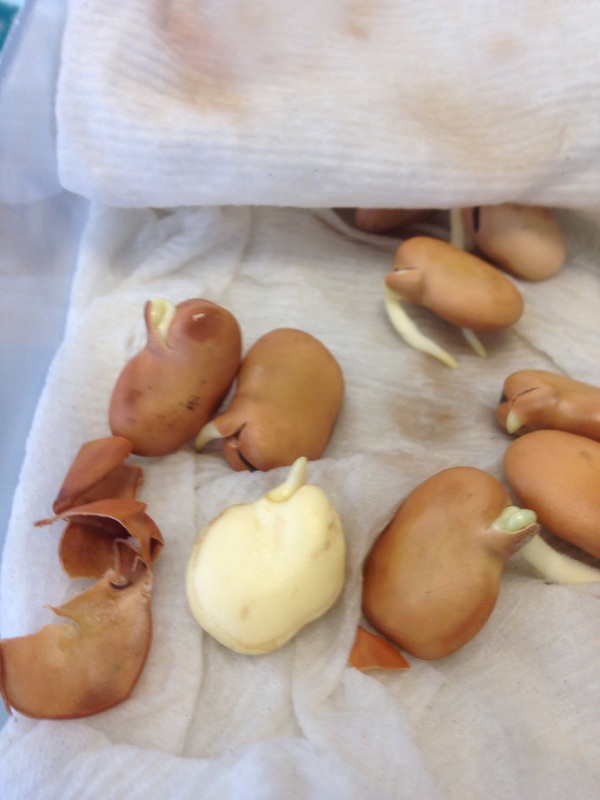 The cotyledons are then placed in boxes. Higher levels of wyerone indicate a higher level of defence response. 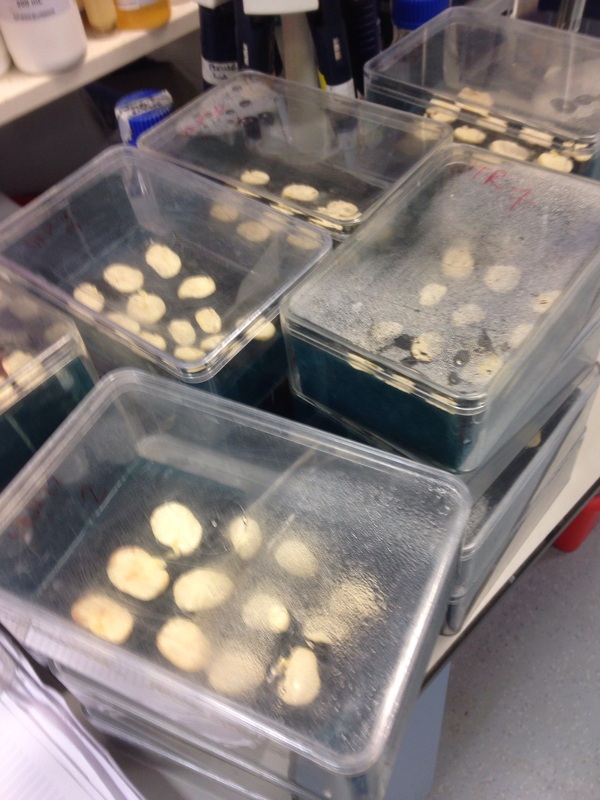 We treated the cotyledons in the following manner and then compared the concentration of wyerone in each treatment. Untreated- these are left as a control to check for background levels of wyerone. B. cinerea only- the cotyledons are infected with B. cinerea, this shows the level of wyerone produced in response to a pathogen. Vanillin only- the cotyledons are sprayed with the product, this shows whether the product actively induces defence responses. B. cinerea and vanillin- see the level of wyerone in the presence of both the elicitor and the pathogen. After being treated, the cotyledons were sampled at different time points to see how time affected the level of defence response. To measure the wyerone present, it must first be extracted and that’s where cotyledon mash comes in. The cotyledons were ground in methanol. 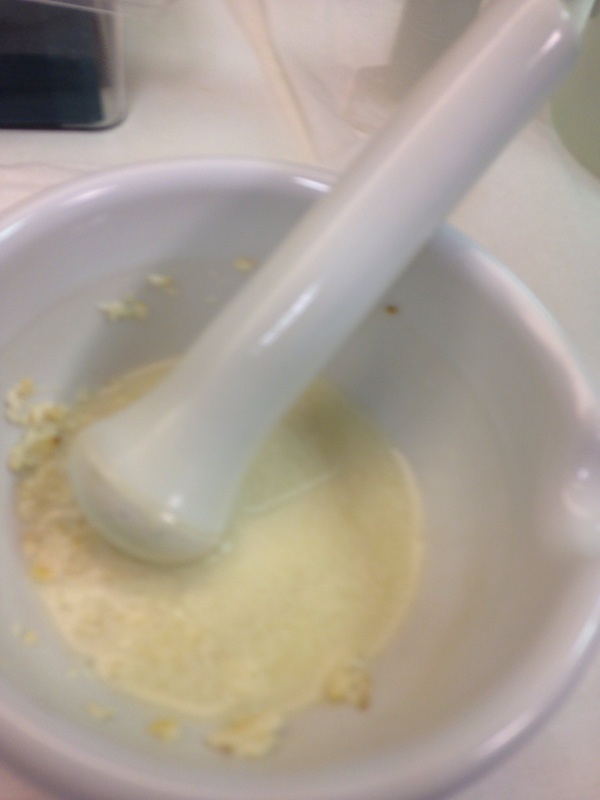 This mixture was then centrifuged, this pushed all the cotyledon ‘gunk’ to the bottom of the tube leaving a clear liquid containing the wyerone (shown below). When cotyledons produce wyerone they become a red/orange colour. 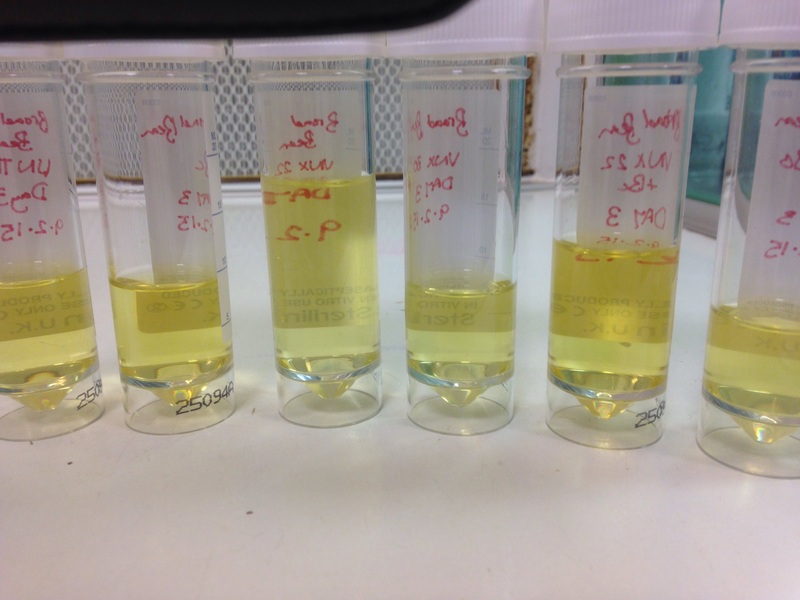 If you look carefully at the above image, you can just see that some of the liquids are darker than others due to the presence of wyerone. These samples can then be run through a UV spectrometer, wyerone fluoresces at 350nm and from this optical density we can work backwards to calculate the concentration of wyerone. 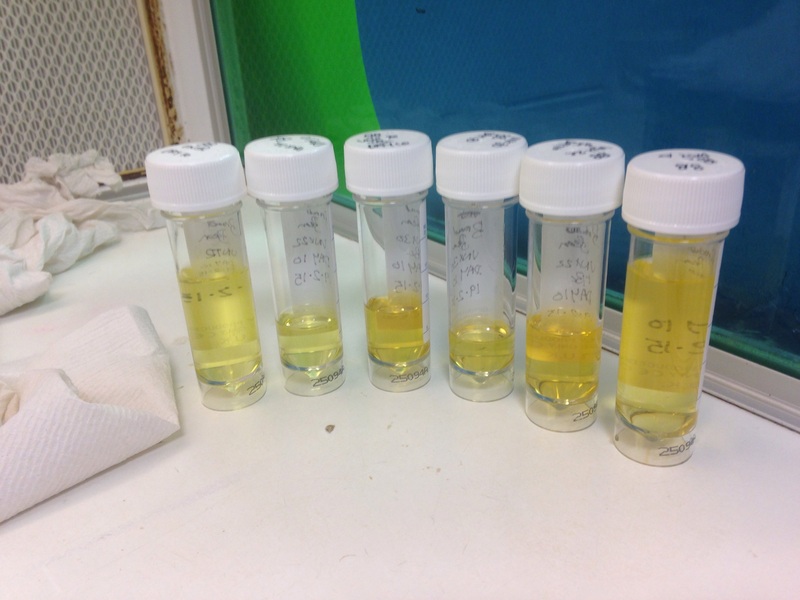 Some of the samples were also run on thin-layer chromatography to get a more pure sample so we could measure the amount of wyerone present more accurately. Chromatography involves the separation of components of a sample in a solvent. A classic example of chromatography is an experiment done in schools where filter paper is marked with a black felt tip and placed in water, this separates the colours present in the felt tip. The lighter colours move further than the heavier ones. The concept is similar in thin-layer chromatography, but it is used to separate compounds in a mixture. The samples are placed on a plate, this is then placed in a tank with a solvent. The compounds then move up the plate. The plate can then be viewed under UV light. The large bright smudges are where the sample was placed on the plate, above those are small lighter bands, and that’s where wyerone has moved to (look at the image below and left). 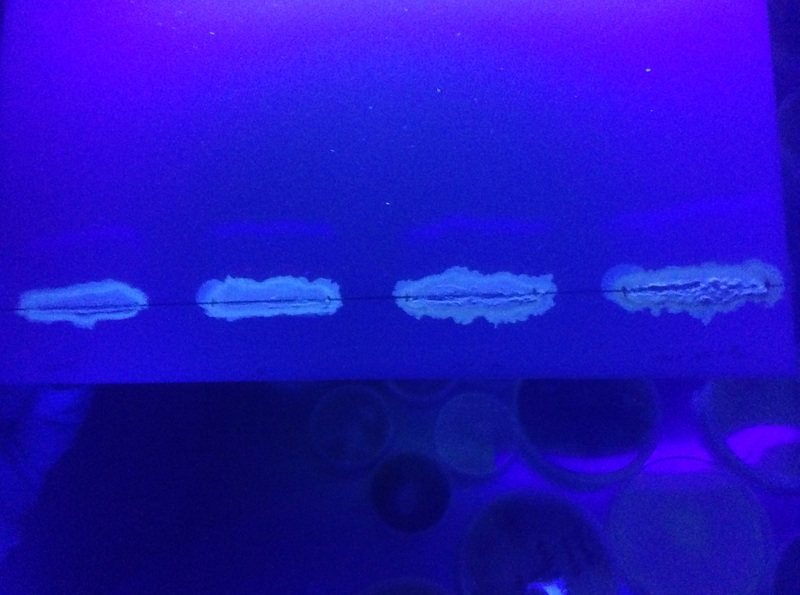 These bands are then scraped off the plate (as shown in the image on the right) and placed in a known amount of methanol. Once again, this is run through a UV spectrometer to obtain the optical density in order to calculate the concentration of wyerone. From this we can calculate the concentration of wyerone in cotyledons at different times post infection. A rough summary of my results are shown in the graph below. Graph of the concentration of wyerone (obviously not the greatest graph but it’s just giving you an idea of my results). On the left are the results from a few days after infection and on the right are results from later in the time course. So, from this graph we can see that treating cotyledons with vanillin does not cause a huge increase in wyerone. However, at later time points applying the vanillin and then infecting with B. cinerea leads to a huge increase in wyerone. This suggests that the vanillin primes responses in the cotyledon so that when it is exposed to a pathogen, the defence responses are more quickly induced. Finally, vanillin is a ‘natural product’, this could be well-timed as ‘natural’ is currently a buzzword. Currently, natural is being used by advertising companies to show ‘goodness’ in contrast to genetically modified organisms etc. which are thought of as ‘unnatural’. I highly recommend sense about science’s Q & A on ‘What does natural actual mean?’ (and any other of their Q & As). 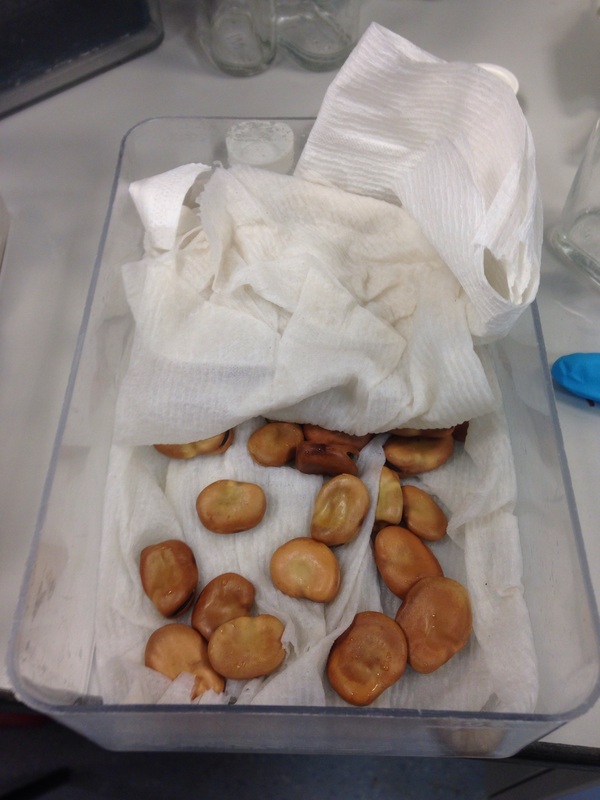 This entry was posted in Project and tagged Botrytis cinerea, Botrytis fabae, broad bean, chocolate spot, plant disease, plant pathology, plant science. Bookmark the permalink. Reisolating “lazy” pathogens from plant tissue often gives them a kick up the,well, you know what, and it restore pathogenicity. If any or your B. fabae is doing something on the leaf tissue, try cutting out a piece of leaf, putting it on 1/2 strenght agar and reinfect leaves with whatever grows out. Thanks, I have been trying to re-isolate it it, but not too much success. Unfortunately I finish it labs next Friday, otherwise I would have tried cutting out part of the leaf. Some other people in my lab are using B. cinerea so I’ve asked them for a potentially more pathogenic strain, so I’m seeing if that will give me some idea of how the product works on leaves. Aah AImee, you’re not very lucky with your pathogen isolates. You should have asked earlier, I am quie sure I have isolates here that infect broad bean. (If I express mail you some spores today you can inoculate tomorrow, and measure the whole of next week ;)). Althogether the wyerone fluorescence (absorbance?) seems a straightforward way to measure response, Well easier than the q-RT-PCR I made you do. Did you see any protection? Does vanillin reduce symptoms? If yes, don’t post it on a public blog or some chinses will scoop it and publish before you (or someone in your group) confirmed it. Ahg, that’s irritating, but hopefully the isolate I have now should work. Yeah, it is pretty simple, though it could be interesting to use q-RT-PCR to see which genes it induces, but that’s for future work. It’s hard to see if there is protection because the isolates aren’t behaving. So we have to do a blog as part of our course and one of the things you have to write about is your project, so I tried to be vague regarding the results, for that reason.